There's not a lot that Roger McGuinn hasnt accomplished in music! He was already a veteran of the New York and Los Angeles music scene when he co-founded the group that would become the Byrds with Gene Clark and David Crosby in 1964. Columbia Records signed the Byrds in January 1965 and they recorded their first number one hit, "Mr. Tambourine Man", the song that launched an eight year hugely successful ride for the band. In 1973 Roger disbanded the Byrds to pursue his dream of a solo career. He made five solo albums on Columbia Records and later joined Gene Clark and Chris Hillman for three albums on Capitol Records. In 1991 Arista records released "Back From Rio", a rock album that included his friends, Tom Petty and The Heartbreakers, Elvis Costello, Chris Hillman, David Crosby, Michael Penn and John Jorgensen. In November 1995, McGuinn returned to his roots and began recording a series of traditional folk songs, available for free at the http://folkden.com. In November of 1996, Hollywood Records released the autobiographical one man show, "Live from Mars". The project includes two studio tracks, "May The Road Rise To Meet You," and "Fireworks," recorded in Minneapolis with members of the Jayhawks. Roger's next CD was recorded on Appleseed Recordings, titled "Treasures From The Folk Den." A CD of favorite songs from the Folk Den with the added bonus of duets with Pete Seeger, Joan Baez, Judy Collins, Odetta, Jean Ritchie, Josh White Jr. and Frank and Mary Hamilton. It was nominated for a Grammy in 2002 in the category of "Best Traditional Folk Album". Epiphone representative Will Jones recently had the chance to chat with this influential artist. EPI: Hey Roger, thanks for talking to us today! Your influence in music as a founding member of the Byrds and your guitar work is immeasurable. I understand that you have recently acquired an Epiphone Elitist Byrdland! What do you think of it? ROGER: Will, it's a beautiful guitar, probably the most beautiful guitar I've seen in my life! The, wood, the gold hardware and pickups, made with Japanese precision, it's just gorgeous! ROGER: It sounds as beautiful as it looks, just incredible, so versatile with the two pickups, switches and tone controls. It's so versatile. When we go to Europe I may only take one guitar and my wife and I agree it will likely be the Byrdland. 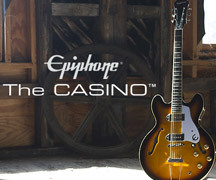 EPI:We also heard you used your Epiphone Byrdland in the studio for your latest CD - "Limited Edition". ROGER:I loved the soft sweet tone of the Epiphone Byrdland on "St. James Infirmary Blues," and the hard rockin' sound on "James Alley Blues." This guitar can do it all! EPI: Tell us a little about the new CD and where is it available for everyone to purchase. 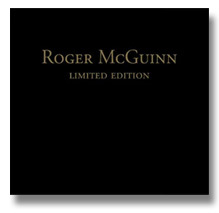 ROGER: The new CD is called "Limited Edition" because it's limited as to where you can buy it. We decided to simply sell it on the web at mcguinn.com and Amazon.com. It's the rock CD that people have been asking for, after my last two CDs which were mostly acoustic. EPI: You are known for playing a 12 string electric with the Byrds. 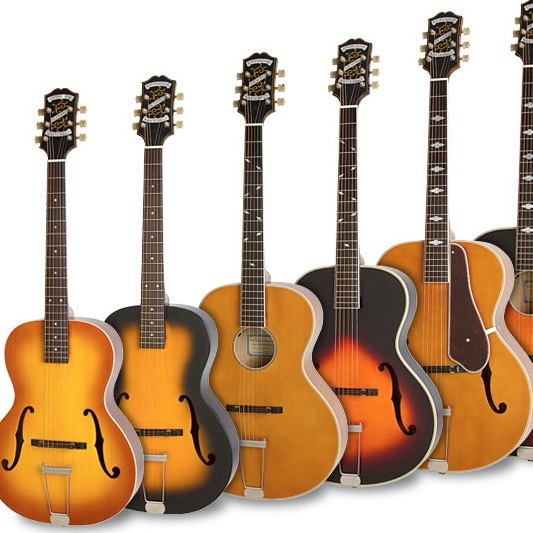 Did you ever play any Epiphone products of the era? ROGER: Well yes, as a matter of fact, the da-da da-da - you know, the guitar part on "Mr. Tambourine Man" was played through an old Epiphone amplifier using a Telefunken E47 microphone and a lot of compression. EPI: Who were your early musical influences? EPI: What attracted you to the 12 string? ROGER: At 15 or so I was exposed to folk music and enrolled at Old Town School of Folk Music. After I got there I got exposed to the 12 string listening to folks like Pete Seeger, Leadbelly, and Bob Gibson. The 12 string guitar had an infectious sound and once I heard it I had to have one. I played it interspersed with the Banjo and a Gibson classical with the Chad Mitchell Trio. I got into the 12 string full-time when I played it with Bobby Darin. It was a Gibson Hummingbird, converted to a 12 string. I still play an acoustic 12string, an electric 12 string and lately have worked the six string into my shows. It all started with a six string I would have in my dressing rooms which I'd use to warm up, and I started playing more blues and bending more and gradually worked it into my stage show. Now I use the three. The electric 12 string can, after a few songs be a bit grating, and I love the Byrdland, it is so warm sounding and wonderful. EPI: What current hit artists do you enjoy? 50 Cent. I like listening to everything and I like some of all of it, Rap, for instance is really just the old talking blues format, except it seems at times violent and angry. I came from the peace and love musical scene...a lot different feel. It seems kids these day still want to just shock their parents, except, we are Baby Boomers and have done most everything so it takes a lot more to shock your folks these days. EPI: What advice do you have for young and aspiring musicians? I went out and played coffee houses, whatever, I played out as much as I could. The other most important thing you can do is stick with it!